A great shot of a line of 1950's Kew-built Dodge 123 Ballast Tippers. This was a publicity photo to promote a great 1957 film called 'Hell Drivers' directed by the American exile Cy Endfield. I remember seeing this film when it first came out at my local cinema in Sheffield at the age of 11 years old. It must have influenced me as in later years, I became a HGV Class 1 lorry driver myself. The film now has a cult following and is available to buy on DVD at Amazon.co.uk. Yes, I've bought it because it brings back so many memories, even though the speeding up of the driving sequence is unrealistic in today's films, it's still a great and classic film. With regard to the shot of Stanley Baker, I worked on that film. I had an Austin 3 Way van and on contract to Pinewood Studios working with the Wardrobe department and the van was used for the artists to change in to the clothes needed for the film. The photo was taken either in WW Drinkwater's yard at Willesden or at the Rush Green pit where most of the work was done. 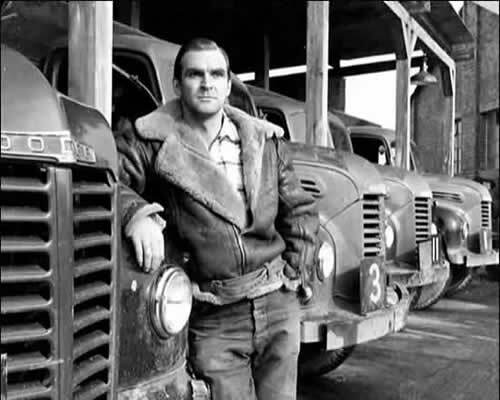 All the driving was done by Drinkwater drivers wearing jackets identical to the ones worn by the artists. I went with them on location down to Brighton where they sent a lorry over the 'Cliff' and set fire to it, so it looked as though it had burst into flame, but actually it was the fire brigade who were in charge of the whole operation there. To pay the farmer for the use of his field, he was given anything left when the fire brigade put out the flames. The look on Patrick McGoohan's face when the truck went over the cliff was fantastic.